These behaviors could be noticed in a child as early as infancy, but usually, they appear during early childhood. If you think your child may be on the spectrum, having your child’s doctor perform “developmental screenings” during checkups will help diagnose if your child has ASD. People with Autism often have trouble with social, emotional, and communication skills. Some of the most common behaviors associated with people with ASD are difficulty making eye contact; delayed learning of language, problems holding a conversation, having a narrow, intense interest; sensory sensitivities, and poor motor skills. While there is no single reason that can be contributed to the cause of ASD, it is generally accepted that abnormalities in brain structure and/or function is a factor. Autism does occur more frequently in individuals with Fragile X Syndrome, Tuberous Sclerosis, and untreated Phenylketonuria. In 2018, the Center for Disease Control and Prevention issued its ADDM Autism Prevalence Report. According to their report, 1 in every 59 children born in the United States will be diagnosed to be on the spectrum. Currently, there is no cure for Autism. However, if diagnosed early, intervention treatments can help improve development with certain symptoms. Intervention treatments may include therapy to help social interaction or speech, music therapy, or sensory integration. 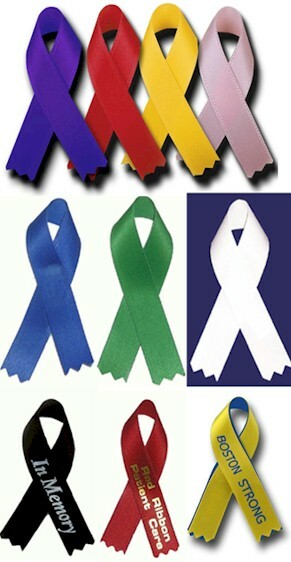 Autism Awareness is known to have one of the most well-known awareness ribbon styles. The Puzzle Ribbon. This design was adopted in 1999 as the universal sign for Autism Awareness. The puzzle pattern reflects the diversity of people living with the condition, as well as the complexity of the autism spectrum. Our Giant Autism Awareness Loop is a great way to show your support throughout April at your office or home. 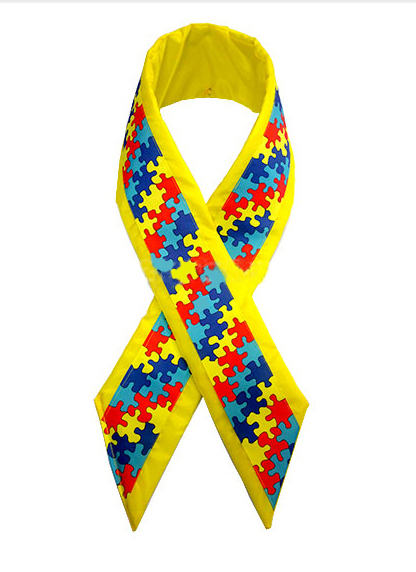 Our Awareness Ribbons and Pins can be customized with the puzzle pattern as well. For more information about Autism Spectrum Disorder, go to http://www.autism-society.org.